Last night I began sifting through the contents of my 56-Drawer chest. I figure if I open a few every evening that it shouldn’t take me long to re-organize and pack away things I know I won’t be using until we move. Rather than start with the first drawer - upper left - I decided to make this fun and pick them at random (well, sort of). The first one I opened, let’s call it #44 if you count down and up, is the one on the right. This drawer is filled with shirtings I’ve collected and I knew there was another drawer just like it, so I had to open and close quite a few until I found it! I pulled out all of the shirtings, removed the duplicates (egad there were a lot), and this is what I have! Why, you ask, has she collected to many shirtings? 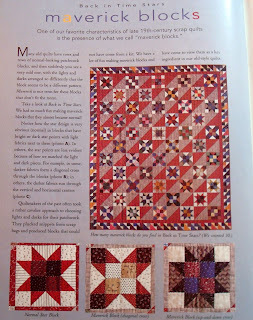 Well, I saw on a long-ago episode of Fons and Porter, this quilt, Back in Time stars, which immediately pulled at my heartstrings. I’ve always been fond of stars and this one with its scrappy/homespun style would someday have to have a home in our master bedroom. The lighter colors in the stars call for shirtings. 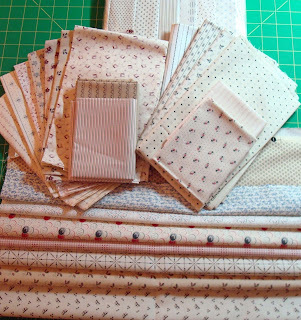 Of course I probably won’t use all of these prints, but a girl can never have enough stash and what’s left over will have another home in a few of the Civil War era quilts I’ve been planning. I’ve also collected most of the other materials - just haven’t found the right background red yet. 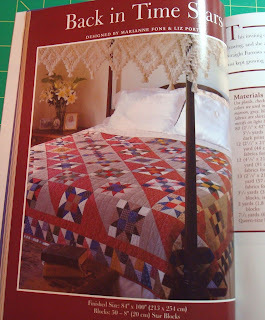 This is a page from the Fons and Porter magazine which contains the pattern. I just love the explanation of the Maverick blocks! I’d like to remind you one more time about my Whirl Into Winter giveaway. Deadline for entries is Jan 14th. The lucky winner will be announced on Jan 15th! You must leave your comment about where you would like to be in winter on this post. Also - very important - you MUST provide an email address where I can reach you if you are the winner! Some of you have not provided emails! If you are picked and there is no email, we will have to pick another name. Good Luck! Oooh, what a beautiful chest! I'm positively drooling over it! Dig that quilt and the chest filled with shirtings. Oh lordy bee that is mighty fine! Candace... How could I possibly write "I love your chest and want to peek in your drawers" without sounding naughty!?! 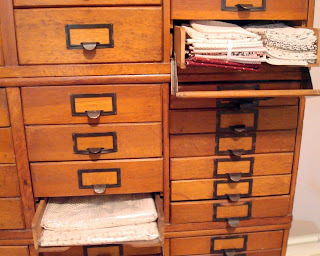 How fun it will be to go through those drawers. Candace, you and your fabulous 56 drawers. I am so envious! This is my first visit to your blog and I think it's great. I have quite a lot of shirtings too. Wish I had a chest like that as well ... so great for storing fabric. Candace I would like to be in Adak, Alaska or Spokane, Washington, the more snow the merrier where I can hunker down, light a fire and quilt away uninterrupted! I LOVE the chest. It's so great!